Most of my readers are aware of the classically-based homeschooling program I am helping to start with some other gal friends. Literature is one of the five subjects we plan to cover. I Love reading books. Love with a capital "L". But reading a book and teaching it classically? Yeah, I don't know what your talking about. But there are programs to teach people like me how to teach the classics and when I was offered one of those programs for free in exchange for a review on this blog I sure as heck didn't say no! Institute for Excellence in Writing (IEW) is a household name around here. Not only have we used the Intensive Writing Programs that they offer, but we have also used the grammar and phonics programs. So I was thrilled, completely thrilled, when I was offered the chance to review their Teaching the Classics program. Teaching the Classics in a video seminar designed to give educators the necessary tools to teach literature using a classical model. You may be wondering what that even means, and you would not be alone. If you grew up reading books and the completing book reports and/or answering comprehension questions on a worksheet then you most likely did not study literature using a classical model. I know I certainly had no idea what a classical model looked like. I am sure there are many ways to present a topic "classically." Teaching the Classics emphasizes the Socratic Method. Asking questions is at the center of this method and is intended as a way to facilitate discussion and discourage lecture. It leaves the door open to develop opinions as well as allows an opportunity for the student, and in my case the teacher, to begin to learn how to think more deeply about the topic. Asking questions instead of telling answers allows time for reflection and the development of knowledge. When you order this program you get over five hours of video instruction and one spiral bound lesson plan book. Yes, I did just say FIVE hours. When I first received the program I had no idea how it could be so long. What about literature could possibly take over five hours to teach? Well, not only is Dr. Andrews teaching you all about foundations of literature like conflict, plot, setting, characters, and theme; he is also teaching you how to use the Socratic Method with your students. He provides models of various graphic organizers (available in the lesson-plan book) and teaches you how and when to use them. Dr. Andrews teaches you these important elements of literature as he is completes mini-literature studies units with you while you watch the course!. He is actually teaching this program to a real-live classroom of educators. The lesson plan book contains short literature selections that you read with the class and complete the questions and charts together. Audience participation is encouraged and this format, although long, is very effective in my opinion. Many reviewers over at The Schoolhouse Review Crew stated they were completing this course with their children, and then planning to start literature studies when their school year starts back up. I didn't really think that watching the video with my kids would be very effective, my oldest is only eleven, and so I watched it on my own, followed along in the lesson plan book, and took tons of notes. I think part of the reason the video took me so long to get through was that I was constantly was pausing and going back so that I could accurately record his last thought and note. I could see how an older student, maybe high school age, could watch the video and learn the skills directly from Dr. Andrews, but my own kids aren't there yet. Although I am not the literature teacher at LMCA, we plan to offer literature and make this series available to the teacher for a reference. It is such an amazing resource to have on hand. I also plan to use this with all of my homeschooled kids in the Fall. I am not talking about making them watch the video, but rather I plan to utilize the information and teaching methods into their normal homeschool routine. Right now my kids read a text and write a narration. The younger ones add an illustration. By teaching my kids how to use the Socratic Method to examine a text they are going to be able to explore literature in a much deeper way then just scratching the surface with a narrative retelling. James will probably lead himself in this manner, while I will lead the younger learners. Family read-a-louds like the ones we read for book club will be examined and discussed as a together. It is definitely a learning process and is not something I expect can ever be mastered. It will help us to more fully explore literature which is at the core of our curriculum. I suspect that this might because part of our daily learning. My opinions on this program are two-fold. First, I thought the information presented was incredible. That's pretty obvious from my statements above. The skills I learned from the videos have changed the way I read anything. I even find myself analyzing Margaret's bedtime stories! I had a vague notion of what the Socratic Method was, but I can guarantee anything I would have attempted before this review would have been unrecognizable as the Socratic Method. Second, the video quality is not that great and the lesson plan book is not as thorough as one would expect for such an extensive study. Although sufficient, I felt I needed to take a lot of notes in order to be able to follow through with this method on my own. As stated above, taking notes took a lot of extra time. In terms of video quality, I am not really sure how this could have been improved with a live audience except to go back in and edit out audience noise and change the lighting a bit for higher resolution. I know if I was reading this review I would be wondering, "Well, what the heck I am supposed to do, buy the program or skip it?" This is what I suggest: the good of the program completely outweighs the aspects that I didn't think were that great. Despite the fact that the lecture is very long and the video quality is only sub-par, I would do it all over again to gain the skills taught. I know when we start schooling again that this program will be one of the foundations that we follow. 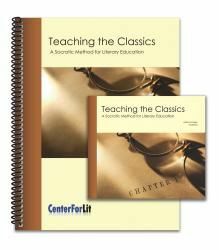 Teaching the Classics is available from the IEW website for $89.00 and includes the video instruction course and the spiral bound lesson plan book. As stated above, Institute for Excellence in Writing offers a full line of amazing language arts programs, many of which I have purchased and used in my homeschool. Other reviewers on The Schoolhouse Review Crew had an opportunity to review Teaching the Classics as well as Teaching Writing with Structure and Style, and Student Writing Intensives A, B, and C. Click here to check out those reviews, or click the banner below.